Gaming analysts expect the online gaming market to cross $60 billion by 2020. Online casino operators are aware that they need to compete fiercely for market share and one of the ways they do this is by offering no deposit bonuses in order to sign-up new players and build their market share. New coupons are popping up daily highlighting the different no deposit bonuses that are available. 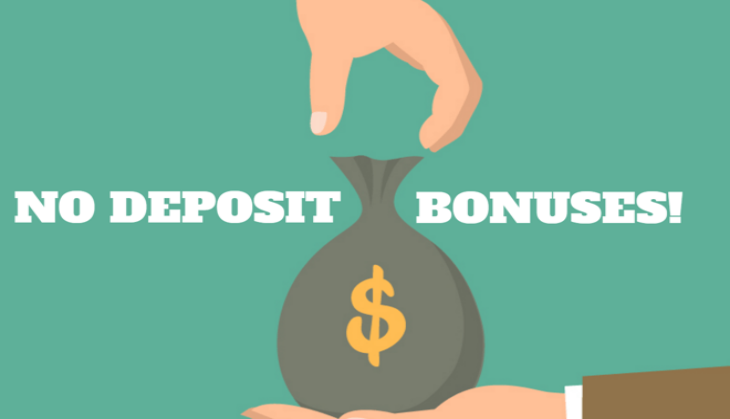 What Does A No Deposit Bonus Mean? A no deposit bonus is basically free money provided by an online casino for its new players. When you sign up with an online casino that has a no deposit bonus, you will immediately get the bonus credited to your account. This is important to new players as they can test out the online casino without having to make a real money deposit of their own. Keep in mind that a no deposit bonus is different from a welcome bonus although there are also a few similarities. The similarity is that a no deposit bonus and a welcome bonus are only available to new players. The difference is that a no deposit bonus does not require players to make a real money deposit while a welcome bonus is usually credited upon your first deposit. Wagering requirements: the number of times that the bonus amount must be wagered before it can be converted to cash. For example, a no deposit bonus of $100 with a 10x requirement means the player must make bets of up to $1,000 or above first before the cash conversion is possible. Game eligibility: most often these no deposit bonuses are restricted to specific table games, video slots, and/or live casino games where the bonus can be applied. Like many other types of free offers and giveaways, casino bonuses come in various, mainly: free money, free spins and free play. Maximum withdrawal: this is the ceiling amount a player can cash out from the winnings generated from using the bonus. Online casinos offer a no deposit bonus as it gives new players the opportunity to check out the online casino, try out different games and judge for themselves if they want to continue playing at the online casino and use real money deposits. We chose these three casinos based on the high dollar amounts associated with their no deposit bonus. Ruby Slots Casino: This online casino offers a $100 no deposit bonus which is available after players create a new account. The wagering requirement is 30x so you have to place bets amounting to $3,000 at least before winnings can be withdrawn. The maximum cashout is set at $100. Virtual Casino Group operates Ruby Slots Casino which is a slot haven. There are more than 160 flash games available aside from the wide range of live dealer games. The games are powered by Realtime Gaming and players will enjoy a great gaming experience at Ruby Slots. Cool Cat Casino: Players can avail the $100 no deposit bonus. Just sign up and your account will be credited with the no deposit bonus. Do keep in mind that you have to comply with the 20x play-through requirements before cash conversion. The maximum cashout is set at $100. Cool Cat Casino’s has a wide range of games which include table games, slots, video poker and speciality games. Most of these online casino games are from Realtime Gaming, so players can expect excellent animation, great graphics and awesome sound effects. There are several multi-tiered progressive jackpot games available, which is yet another reason to signup and take advantage of the no deposit bonus. Money Storm Casino: This online casino currently offers one of the highest no deposit bonus in the industry. New players will be eligible to claim the $300 no deposit bonus once they create an account. While the no deposit bonus is very impressive, the wagering requirement is very high and is fixed at 99x while the max cashout is set at $150. Opera Corp Limited, a company based in Lebanon operates Money Storm Casino. The online casino has partnered with BetSoft and offers a wide variety of games which include 3D slots, classic slots, table games, video poker and live dealer games. Conclusion: Players can take advantage of these special no deposit bonus casinos in 2018 and use the free cash to try new games and determine which online casino works best for them. First Pacific Rim Uprising. Then Ready Player One. Why are movies being cancelled in India?